Down a sly Melbourne alley and up some welcoming stairs lies a home of all things alcoholic and fine; Murmur Bar. Head on up for a night you’ll always look back on with a smile. You can even hire Murmur Bar out for functions both large and small! Concealed behind a red doorway in a covert laneway off Little Bourke street resides Portello Rosso, a small tapas and Jamón restaurant. We pride ourselves on our honest and passionate interpretation of the Spanish way of dining and drinking: shared plates, fresh produce, Spanish wines, Sherry, Sangria, Paella and succulent slices of Jamón, all tied together with relaxed yet professional service. We cater to both small and large parties and are open for both lunch and dinner on selected days. You can book a table for up to 25 people or you can book out the whole venue for a private function, perfect for personal or work celebrations. The Spanish way of eating is more than just satisfying an empty stomach – food is savoured and indulged communally. It’s not hard to fall in love with their way of life and their cuisine: simple, unpretentious and using only fresh, seasonal and mouth-watering ingredients. At Portello Rosso, we want to share our experiences and memories with you. Sit back, relax with a glass of wine, share a bit of everything and we hope you enjoy a little dose of Spain… without the jet-lag. 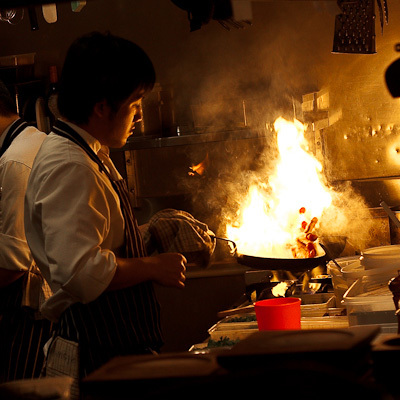 Stay up to date with Melbourne’s top food and drink venues!